Last week I went to Morley Gallery to see an exhibition called Lambeth Prospects. It was followed by a lecture from Jon Newman, an archivist and co-curator of the exhibition. The first part of the exhibition was about early Lambeth. Once called Lambehitha, it was the place where lambs were arrived from ships and was central and accessible by river to the rest of London. “From Lambeth we began our foundations lovely Lambeth!” (William Blake, 1808). The second part of the exhibition was about portraits. Its proximity to the city of London and Westminster has meant that Lambeth has been home to some famous and powerful people over the centuries. There are long lists of Archbishops of Canterbury, Dukes of Norfolk and members of parliament and government ministers including Herbert Morrison. There are social reformers like Lillian Bayliss, architects and developers like Thomas Cubitt, writers and artists including William Blake and Angela Carter, entertainers and musicians such as DanLeno and Linton Kwesi Johnson, explorers like Edward Whymper and war heroes including field Marshall Montgomery and Violette Szabo. The third part was about modern Lambeth. It looked at the settlement of north Lambeth and had images in a selection of oil paint, water colour paint, print, photography and film to provide an insight into Lambeth over the centuries. The fourth part was about the suburbs of Brixton, Clapham, Norwood and Streatham. I recently attended an Iraqi Cultural Attaché in London, which exhibited the work of six painters and some poetry readings. The painters were Ali Jabbar (he is a painter, sculptor and designer and also organised this event), Amin Shati, Abeer Al Kateeb, Sadek Toama, Emad Al Taeey, Waleed Sheet and Allaa Jomah. The poetry was in Arabic language. The poets were Adnan Al Saek, Worood Al Mosawey, Khreeb Eskander and Salm Surhan. 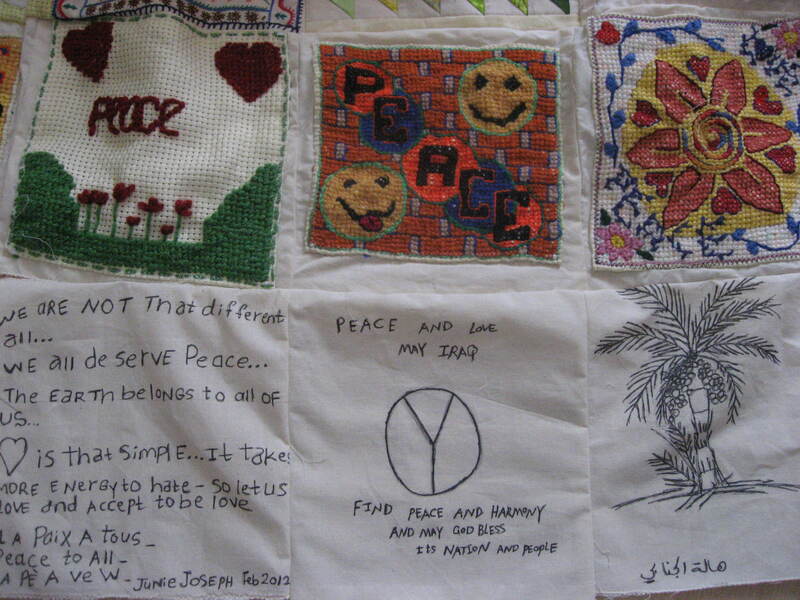 I recently received three pieces of square fabric for my Piece for Peace project. Today I added them to the hanging. The picture below shows these three pieces at the bottom. This week I went to the pure exhibition at Olympia. It is for people and companies who work in the fashion trade. I found the work of the designers was very inspiring. There were designs and patterns from around the world. I ended up leaving with 19 free shopping bags. Yesterday I exhibited my Piece for Peace hangings at Imperial College London. These hangings represent the need for peace in Iraq. Imperial College has an Iraqi society and they hold a cultural exhibition every year. These hangings are a continuous piece of work, which anyone can contribute to. If you are interested please get in touch or leave a comment. Today I walked between Blackfriars Bridge and Waterloo Bridge. I passed offices, galleries, shops and cafés. Some of the galleries and shops were of designer textiles, ceramics and hand crafts. There were benches that had plaques saying “Everybody needs a place to think”. There was a statue of two women called “London Pride” by Frank Dobson (1886-1963). It was commissioned by the Festival of Britain 1951. It was given by his widow Mary Dobson in 1987 and was placed on South Bank. Near to it there was a statue of the actor Laurence Olivier (1907-1989) as Hamlet. It was sculpted by Angela Conner. He was also known as Baron Oliver of Brighton and was the Founding Director of the National Theatre between 1963 and 1973).